Education is a crucial component of the TAPA programme. We must educate the community about what we are doing and why we are doing it. We must also change people’s attitudes toward animal welfare and the environment, as well as introduce concepts of responsible pet ownership. As always, the real change will come through the children. 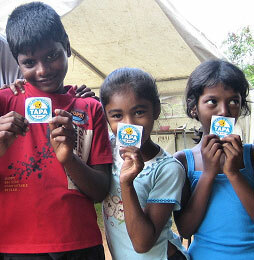 Enthusiastic children participate in TAPA’s education programme. The programme will target children ages 7–10 and will incorporate interactive sessions to encourage and facilitate learning. what we are doing and why it works. The TAPA team meets with the authorities and members of the community before we start work in an area. We explain that sterilisation and vaccination will humanely stabilize the animal population without killing, while, at the same time, reducing the risk of rabies and dog bites. We also explain that education is a crucial component of the solution. We seek agreement that in exchange for our services, the local authorities agree not to kill dogs as a misguided form of rabies control. Cooperation with local authorities after they understand our objectives. Once the community understands what we are doing, they often turn out to help in whatever way possible, including providing transport to bring dogs to us. We also coordinate with the Public Health Inspectors (PHIs) of the Ministry of Health, which administers the anti-rabies programme. The PHIs know each community well and open many doors for us. 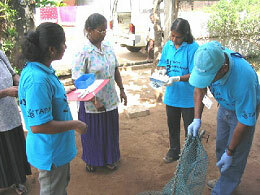 As a result, on average 50% of the dogs brought to the TAPA field clinic are brought not caught! This supports our strategy of sterilising both individually owned dogs as well as community dogs within the tsunami zone to manage the population. Dog bites are a special concern in Sri Lanka, especially bites of children who are more at “eye level” with the dogs and want to play with them. Most dog bites are due to ignorance. Dog bites put both the people and the dogs in the tsunami zone at risk. And even if the dog is known to have been vaccinated, those bitten must go to a public hospital to seek the costly anti-rabies treatment, which is a significant drain on government resources. The best approach is education on how to avoid dog bites in the first place. The colour graphics reflect the Sri Lankan environment, including typical scenes of Sri Lankan dogs, children, and adults. These leaflets are used in our community education programme. We have made the leaflet publication and graphics files available without charge to any other groups that would like to use them, adding their own logo. We just want to get the message out. We are very pleased that a Hindi version has now been produced in India, a Chinese version in China, and a version in Georgian in the Republic of Georgia. The leaflet is also being introduced in Nepal and the Philippines. Contact us for the native Adobe Illustrator files. Studio Labels of Adelaide, Australia, recently designed and donated thousands of colourful stick-on labels for TAPA to promote sterilisation and vaccination. These labels have proven to be a real hit not only with the children, but with the trishaw (three-wheeled taxi) drivers as well! “Vaccinate and Sterilise” is the message.